NEW ORLEANS – The collegiate outdoor track & field season is underway! We saw a number of strong performances this past weekend. No team got out to a faster start to the outdoor season than Houston. The Cougars, who hold the collegiate record in the 4×100 relay at 38.17, went sub-39 this past weekend at the Cougar Spring Break Invitational: 38.82, to be exact. That was the second quickest time ever run by a collegiate team this early in the season. Houston’s relay team consisted of Nicholas Alexander, Mario Burke, Brandon Taylor and Travis Collins. Burke recently finished second in the 60 at the NCAA DI Indoor Championships. 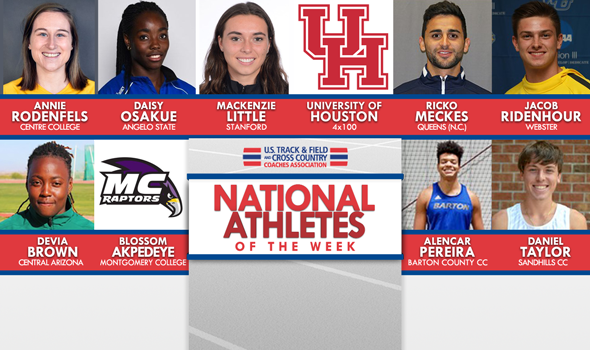 This is the first time that Houston received a National Athlete of the Week honor during the outdoor season and the first time that an NCAA DI men’s relay team took home accolades. Mackenzie Little couldn’t wait any longer to get her senior season started. Little, a member of The Bowerman Watch List, opened up in the javelin this past weekend at the Hornet Invitational in Sacramento, California. She launched the implement 194 feet, 2 inches, which is the second longest mark of her career behind the 198-foot missile she threw last year to win the NCAA title and become the fifth best performer in collegiate history. This is the first time that an athlete from Stanford has been named National Athlete of the Week during the outdoor season. Ricko Meckes was selected as National Athlete of the Week after posting the best mark so far by a collegiate athlete this outdoor season with a javelin toss of 74.25m (243-7¼) at the Charlotte 49er Open. The German native won the event and set a school record in the process. The showing also ranks the graduate student as the sixth-best all-time performer in NCAA DII history. Meckes is the first male athlete in program history to be honored during the outdoor season and just the second all-time, joining Nikia Squire who won the honor in 2016. Daisy Osakue is a National Athlete of the Week honoree after she re-broke the NCAA DII national record with a chuck of 60.04m (196-11¾) in the discus at the Wes Kittley Invite this past Friday. The toss won the event at the meet by almost eight meters and currently puts her as the No. 1 collegian across all NCAA divisions so far this outdoor season. It is the second time of her career that Osakue has been a National Athlete of the Week selection. The sophomore standout joins Kami Norton and Nils Fischer as the only athletes in school history to earn the award. Jacob Ridenhour, fresh off indoor campaign that saw him PR in the 60 and reach the NCAA Championships, returned to the track this past weekend at the Rhodes Invitational. Ridenhour clocked a pair of nation-leading times. He started things off with a 10.67 in the 100 and followed that up with a 21.60 in the 200 – both of which are PRs. This is the first time that an athlete from Webster has been named National Athlete of the Week during the outdoor season. Annie Rodenfels made quick work of the competition this past weekend at the Margaret Simmons Invitational hosted by Murray State. Rodenfels, competing in the 5000, won by 1 minute, 31 seconds, when she crossed the finish line in 16:45.23. That was nearly 30 seconds faster than the time she ran at the Dr. Keeler Meet last May, which was the last time she ran an outdoor 5000. The senior, who recently finished second at the NCAA Indoor Championships in the 5000, is currently ranked first nationally in the 5000 and second nationally in the 800. This is the first time than an athlete from Centre College has been named National Athlete of the Week during the outdoor season. Alencar Pereira picked up a National Athlete of the Week selection after recording the second-best performance in NJCAA history with a best toss of 65.71m (215-7) to win the hammer event against a field of DI athletes at the TCU Invitational over the weekend. The showing ranked Pereira as the fifth-best performer in the event across all collegiate levels (including NCAA) this past week and also set a new school record. All six of the freshman’s throws traveled farther than the old school record of 61.13m (200-07). Pereira is the second male and third athlete overall to earn an National Athlete of the Week distinction in program history. He is the first to do so since the 2015 season. Devia Brown was the top choice for National Athlete of the Week after she posted a best throw of 16.05m (52-8) to win the shot put at the Willie Williams Classic over the weekend. The standout sophomore, who already ranks second in the event all-time in NJCAA history, will have another performance in the all-time top-10 as the showing ranks in a tie for the eight-best performance. The effort was also the fifth-best across all collegiate levels (including NCAAs) this past week. To go with the win in the shot put, Brown also won the discus and hammer events at the meet. Brown is the fifth athlete overall and the third female to earn a National Athlete of the Week honor in program history. Daniel Taylor picked up right where he left off last outdoor season. The sophomore surged into the national lead with a pair of automatic qualifying times for the NJCAA Championships in the 1500 and 5000. His time of 4:10.14 in the 1500 leads the nation by more than 17 seconds, while his 15:48.59 in the 5000 is tops by more than one minute. This is the first time that Taylor picked up a National Athlete of the Week honor during the outdoor season. Blossom Akpedeye made an immediate impact for the Raptors. The freshman from Lagos, Nigeria, is the national leader in both the 200 and 400 based on her efforts at the Maryland Invitational this past weekend. Her time of 26.19 in the 200 leads the nation by more than two seconds, while her time of 1:02.20 in the 400 leads the nation by more than five seconds. This is the first time that an athlete from Montgomery College has been named National Athlete of the Week during the outdoor season since 2015 (Bryea Rhodes earned the honor on April 14, 2015).